Jasmine Pearls Green Tea is one of my favourite teas. It smells absolutely beautiful and tastes like heaven to me. So sensual, sweet and yet refreshing! Feels like I am drinking a beautiful meadow on a sunny day. I have a real passion for tea and opened up a tea shop selling loose premium tea for a little while but it has closed down now due to the Crossrail Development by Transport For London. I have sourced a lot of green teas from Vietnam where I go quarterly to design my fashion collection for my boutique. There is so much I have learned about tea and I love everything about teas from how they taste to their health benefits to how they should be consumed. I would love to bring this to our supper club and hope that one afternoon we will host a tea tasting event to be enjoyed with the great food we will also serve. I have discovered so many things about tea - like the different varieties and grade of green teas, black teas, oolong teas. Why the teas are categorized into blacks, greens, whites etc. Its all to do with the oxidation process much like when you cut an apple and leave it, it turns brown, the more you cut it or bruise it, the apple changes its condition. This is the same thing with tea. All tea comes from the plant Camellia Senesis like wine comes from grapes. Depending on where it is grown, how much weather it has had, when it was harvested and treated results in different types of tea. For instance, my favourite tea is a variety of green teas. Compared to black teas it has been less processed and gone through less of the drying and roasting process which gives it its unique green tea flavour and contains much more antioxidants and less caffeine than black teas. Within the green tea range, there are many processes to make all sorts of green tea from Sencha to Matcha, to Dragon Well thumb pressed leaves to rolled Jasmine Pearls. This is where it gets very interesting because one can taste a huge difference in green teas depending which kind it is. 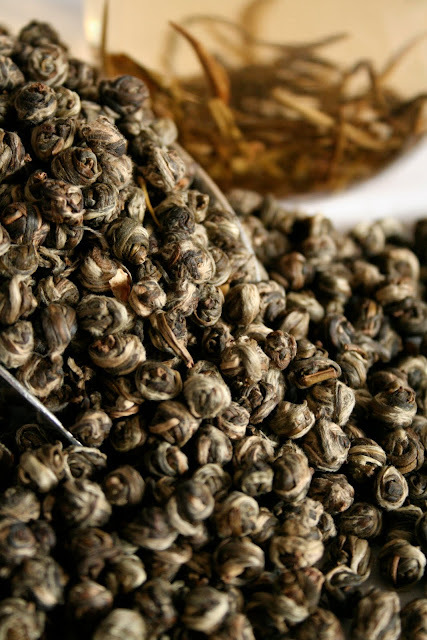 Once you have acquired a taste for premium teas there is no going back. The difference is massive and life just gets more wonderful once this experience is had, I promise! Considering that the British drink so much tea and sadly I do drink it too - the builders' brew with milk and one sugar - hardly anything is commonly known about tea. This is very sad to me. The tea we so commonly drink is the lowest grade of tea, usually the dust of tea - the bits no one from the rest of the far eastern world would touch. It is not very good for us and we have to hide its taste with milk and sugar. Tea is about labour of love - handpicked, hand rolled, hand pressed and protected to provide the best tasting drink. 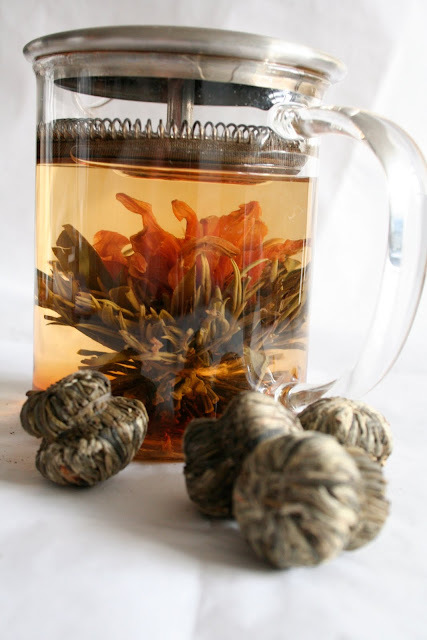 White tea is purer than green teas containg more antioxidants than any other tea. Imagine, not so much has been done, just hand picked and laid to dry over the March & April then sometimes scented with a layer of Jasmine over August nights when they are at the height of blossom under China's mountained skies. Tastes supreme! Like all great partnerships, Simon loves his coffee so we are re-branding the existing 'Teaspoon' to 'Fernandez & Leluu'. You can buy our teas at very competitive prices (now) and weasel coffee (from January) online at http://www.leluu.com/c/130779/1/tea-by-fernandez-leluu.html. Free Delivery in UK. There will be an interesting post about Weasel Coffee which we served at one of our events. Its an unforgettable and amazing coffee. Hand Tied Osmanthus Green Tea Balls - tastes like honeydew.